Which is best: 205/45/17 vs 215/40/17 tyres? Like many petrol heads, I understand how fundamental tyres are to how a car handles and changing tyres is something I like to think carefully about. When my Honda EP3 Civic unexpectedly failed it's MOT on two misshapen rear tyres I was faced with a tough decision - replace just the two rear tyres in the same size (215/40/17) or buy a complete set and swap back to the OE size of 205/45/17. 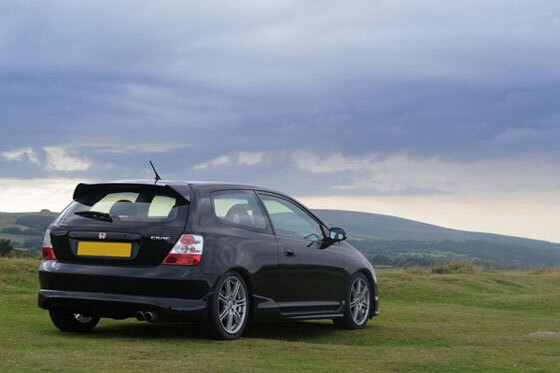 It was only after owning the Civic for several months and feeling a bit unhappy at how harsh the ride was, that I realised the previous owner had put wider, lower profile 215/40/17 tyres on. I imagine that on silky smooth roads or on a track this profile of tyre would be beneficial but on UK roads I found the ride too crashy and it felt like there was not enough compliance to deal with the bumps and imperfections in the road, with the result being less grip and an uncomfortable ride. I also felt the low profile tyres were contributing to tramlining. Previously owning a Peugeot 306 GTI-6 (which I directly compared to the Type R in this review), I'm a big fan of what would now be considered van tyres. The 306 used to run 195/55/15 tyres and they were bloody brilliant, it would eat up a bumpy B road like nothing else and speed bumps could be taken at a decent speed without that horrible feeling that you are going to blow a damper. With this in the back of my mind, I took the plunge and purchased a set of Bridgestone Potenza RE050A in 205/45/17 from BlackCircles.com. If you are wondering, the previous tyres were Falken FK 452, which have a pretty good reputation online. The difference was night and day - the higher profile tyres gave much more compliance and increased ride comfort considerably. Confidence and grip were also vastly improved, although some of this would have undoubtedly been due to the new tyres. Road noise was also reduced but I don't know if this is due to the tyre profile change or different model of tyre. In my opinion, the ride on the Honda Type R is stiff enough without having to drop to a lower profile to get increased control and I would strongly recommend sticking with the tyre size that Honda intended when they designed the car.